I turned my back on flummery after my first child was born. I was perplexed: he had presented against all expectation as a boy. Whaaa?? BUT THE RING SAID IT WAS A GIRL! Admittedly, the Ring had form in this regard, having two weeks earlier inaccurately diagnosed my friend Tracey’s baby as male. But I had failed to take heed. I’d assumed there was something the Ring knew that we did not (an earlier pregnancy, concealed or forgotten). Because in my family, where babies were concerned, the Ring was the Oracle. It had correctly predicted the gender of my sister’s baby (boy), and never failed to tell the same story for my mother – girl, girl, boy, boy, boy – or my grandmother – girl, girl, boy, boy. 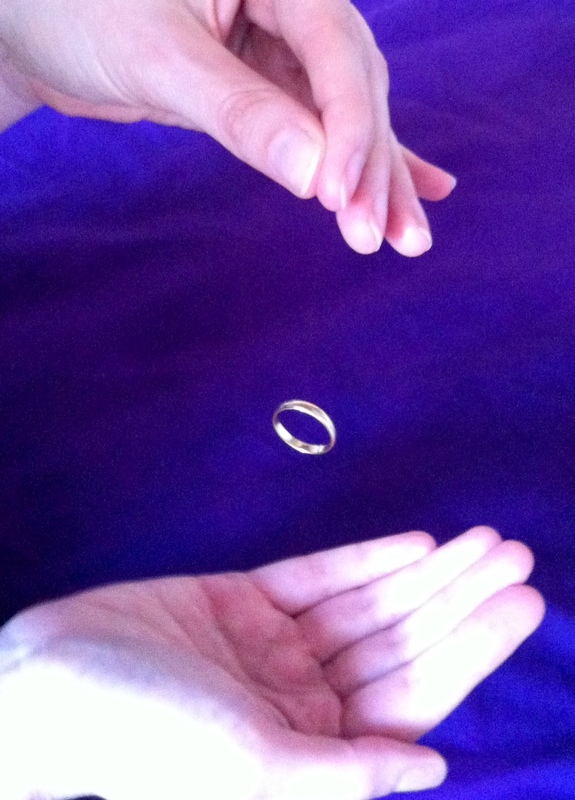 If you are unfamiliar with the Ring, it works like this: you suspend a gold ring (ideally from a happy marriage) on a chain, or a hair from your head, over a woman’s hand or pregnant belly, and wait until it begins to swing either back-and-forth or in a circle, in order to determine the gender of her children, whether she has already had, or is yet to have them. The ring will report each child one by one, and then be still – circles for a girl and back-and-forth for a boy. Try it, if you haven’t before. You don’t need magic powers; it works for anyone. It’s the kind of thing you think must be a fake, that the person suspending the ring must be somehow influencing the ring’s motion, until you take hold of it yourself. Then you watch as, eerily, the Ring takes on a life of its own, moving at first so minutely you can’t tell the direction, but gradually swinging more strongly until it feels as though it will pull from your fingers. Then it slows, sometimes changing direction, sometimes stopping altogether before beginning again. It is most definitely Weird. Sonography back then was not what it is now, but still, I could have had confirmation of the baby’s gender at the scan had I wanted it. I didn’t, though – it was more fun to trust the Ring. Because, of course, it didn’t really matter: we ‘just wanted it to be healthy.’ But the shock I experienced when the baby was born the ‘wrong’ gender forced me to acknowledge how much faith I’d actually put in this bizarre ritual. It’s not as if I’d even especially wanted a girl – I’d just wanted to be able to plan and dream and prepare. I had a name and a fond diminutive for my baby, I talked to her constantly in my mind, imagining dresses and dolls and makeup and shopping. Had the Ring said it was going to be a boy, I would have visualised ball games, climbing frames and Lego instead – but the truth is, it was very difficult to imagine a male creature coming from my female body. It felt right that the baby inside me would be a girl, and so I gladly accepted the Ring’s prediction, sparing not a thought for the alternative. I wasn’t proud of my reaction when the surprise son turned up, in fact I was completely mortified that I’d been so foolish; but nonetheless it took a while for me to accept that the stranger I’d been preparing to receive into my life had turned out to be somebody else entirely – and the shock meant that it took longer than it should have done to bond with my baby. The second time around, I knew I had to know for certain, and even paid for a second scan when the first one didn’t yield a conclusive result. I wasn’t really surprised to hear that it was – yes, another boy. That afternoon, I made a little time to grieve for the daughter I would now never meet – I knew there would be no more children after this one. My husband caught me crying and was upset – why wasn’t I rejoicing about the baby I was having, the fact he was healthy and whole, our luck in conceiving him? It was difficult to explain that I needed to let go of the hope-daughter, the little girl I had carried in my heart for six years, before I could truly rejoice. And I was so glad I had a chance to do this before my gorgeous son was born, because it meant that this time around the joy was completely unalloyed. Recently there’s been some grumbling in the press about the latest craze for baby-gender-cake parties, and the modern preference against ‘being surprised.’ Speaking for myself, I was hugely grateful for the advance notice, although I probably wouldn’t have chosen to find out my baby’s gender through the medium of cake. I’m not criticising anyone who does. After all, I was the one taking messages from a wedding ring. Seriously, though, try it yourself. And then explain it to me…. This entry was posted in Musings and tagged baby gender cake, baby gender lore, old wives tale, ring test. Bookmark the permalink.